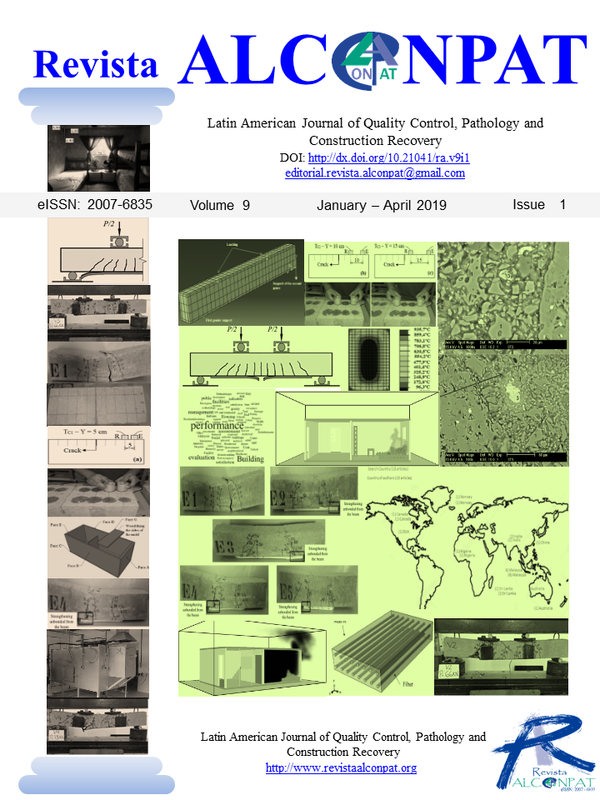 The Revista ALCONPAT (RA) is an international scientific electronic journal of the Latin American Association of Quality Control, Pathology and Recovery of Construction that aims to publish case studies related to quality control, pathology and recovery of buildings , contributions are welcome product of basic research, applied, documentary or review articles, directly related to the solution of problems in these areas. (RA) is aimed towards the scientific and technical medium of the construction industry, related to: exterior finishes, climate action, accidents and meteors, legal aspects, ethics, costs, education and learning, execution, human factor, structural elements, decorative elements, management, facilities, safety, materials, characterization methods and methodologies, standards, works, projects, international networks, use and maintenance. The manuscripts will be subject to a peer review process by a scientific committee and anonymous reviewers in a double-blind process, in which the authors do not know the evaluators and vice versa. It also authorizes the author to upload the article, in the format published by the journal (author’s guidelines), to their personal website: http://www.revistaalconpat.org; the author may also distribute copies of the published article in an electronic or printed format to anyone they consider convenient and reuse parts of the article in future articles, provided that the corresponding credit is given (citation).